Garden bumblebees do not fly over the surrounding fields, but regularly take nectar from garden plants. They do this even on cold spring days. Bumble bees are different from bees, because their family lives for only one season. Early in the spring, the females of bumble bees climb out of turf, where they spent the winter, fly slowly over the ground, searching for a place to nest. Preference is given to rodent burrows, where there is a fibrous strengthening material. After making a small nest, the female carries pollen from spring honey plants, and at the entrance it constructs the wax “pot” and fills it with honey. Eggs are laid, the female warms them with its warmth. Larvae turn in working bumble bees. By late summer the young females appear, they fly away and mate. Pay attention to late autumn honey plants – you can see the male bumble bees. You can take them with bare hands – the males do not sting. And you can feel the perfume scent that attracts females. Young fertilized females fly and burrow for the winter in the turf. In the nest there are only parasites, in the following year the slot is not used. Sometimes a small house for bumblebees is a piece of asbestos pipe, closed at both ends, with a hole for a notch, flower pot, as shown here in the picture, and even a birdhouse. Inside the nest a half is filled with soft hemp or wool. Notch of the bumble bee nest in the picture is covered from the rain with a piece of wood slat, lying on the stones at the edges. House-hive from flowerpot – it’s just for nesting bumblebees and do not despair if bumblebees do not come, they occupied less than half of the artificial nests, which is considered very successful. House-hive for bumble bees, made from scrap of boards, usually has cubic form. Side of the inner cavity is 12-14 cm (5”), wall thickness is 2.5-3 cm (1′), length of pipe is 90-100 cm (35-40”), inner hole is 1.5-2.0 cm (0.7”). It is easy to make bumble bee vestibule inside the hive-house, then it will be about twice longer. Tunnel in this case is not required. House has removable cover. It is not necessary to bury it in the ground. Then you can paint the outside of the box. Inside the walls and bottom are draped with loose cotton, hemp, hay from old bird or mouse nest. In winter or early spring you should clean out and disinfect the house-nest for bumble bees, put a new soft layer. 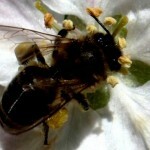 Female bumblebees, looking for a place to nest in April-May-June, prompt the location of the nest-hive. It can be any cozy, not soggy corner of the garden. Bumblebees are not aggressive and get used to the close proximity of man. The only thing that is necessary to protect the hive from ants, who can enter the nest not through tunnel, but through the cracks of the walls. the right (b) – the structure of bumble bee box. Transparent plexiglass lid is designed to not disturb the nest of bumblebees during the revision. 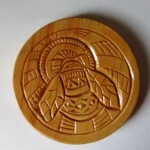 For a simple bumble bee box you can use almost any small wooden box with an inlet on one side at the bottom. Dimensions are not critical: width – 15-30 cm (6-12”) length – 15-30 cm (6-12”) and a height is about 15 cm (6”), with a removable lid. The cover should hang over the sides of the box to protect it from rain and can have waterproof coating to keep the internal space dry. Several small holes can be drilled on the sides near the top for ventilation. Entrance hole should have a diameter about 15 to 20 mm (0.6-0.8”). There is a more perfect design with two sections, as shown in the figure. It is useful if you have to move the family of bumblebees somewhere, then food for bees (pollen and syrup) can be put in the vestibule room. 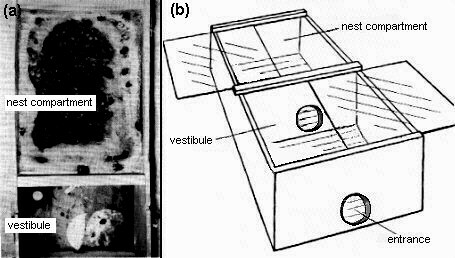 Also, to watch the bumblebees without worry, you can install retractable glass, closing the nesting compartment under the main cover of a box, as shown in the figure, although it can cause problems with condensation. It is very convenient to inlay the bottom with corrugated cardboard. It absorbs excess moisture and speeds up cleaning of the nest. Whatever type of nest-box you use, nested branch must have material for heat retention. In nature, bumble bees often use abandoned nests of mice and if such material is available, it is ideal for bumble bee nests. However, you can replace it with wool or viscose cotton, truncation of dried grass or hay, dry moss. Also grass and moss from the old bird nests are suitable. Raw cotton should be avoided because it can clog up the legs and body of bumblebees. You can not use glass wool. The best places are on the ground near the fence, hedge, windbreak panels, borders of shrubs and other places where you can see the spring female founders (bumble bee queens) looking for a place to nest. Choose a warm, dry, safe place, preferably south-facing, but shade from direct sunlight. Put a large rock or brick on top of each box to prevent the opening of the cover or offset by the wind or potential predators. The success of settling of nest by bumblebees is unpredictable and perhaps is 25% (1 of 4) – and so you should use a lot of boxes. Overwintering fertilized females (queens) search each year for a new base for the family. Bumble bee box from Oxford Bee Company is the best one for the females, who are looking for a place to nest in the spring, to found a new family. 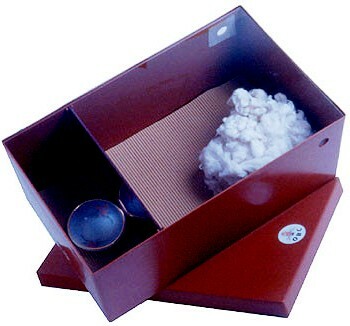 Two-room nest has inside a saucer to feed, cotton as a material for a nest, litter carton (for easy cleaning), and a protective plastic cover to inspect the nest. Two sealed mesh holes in the large compartment are designed for ventilation. The same size holes on the front of the hive (next to the saucer) are used to enter the vestibule and the nesting chamber. This house has a small entrance room – the lobby, and a saucer to feed, in which you can pour the diluted syrup or honey, and a large internal compartment containing wool (wool for upholstery). Input department gives newcomer queen-female the space and food, which allows it to feel like home, separately there is a large room, where the queen female will use the wool to make a nest in which it will make the first pots to store honey and pollen and lay eggs. Then the first of several generations of workers bees hatches. They gradually take over the duties of collecting nectar and pollen, freeing the queen of this work, allowing her to stay at home, just to lay eggs. Note: To save the heat you can put more wool. At the end of the season queen produces a generation of males and new queens. Males leave the nest and search for virgin queen females that mate. The new queen, once paired, looking for a suitable place for the winter. A male and the family eventually die, leaving the hibernating queens to begin a new life cycle in the spring. Bumblebees are the exclusive pollinators of many species of shrubs, trees, garden flowers and vegetables. 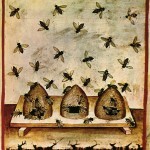 Put this hive in your garden in the spring and maybe bumble bee queen (female-founder) settle there. It found a family, which will live there until the fall. If the bumble bee colony lived in the hive, at the end of the season it should be cleaned and sterilized from parasites. It’s easy enough to do it in a plastic hive. Unoccupied hives are not needed in such cleaning. 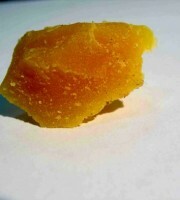 - viscose or cotton wool. Drill ventilation holes at the top of the side panels. Close up with a fine mesh, which should be well glued or nailed inside. Connect the side panels to the front and back, to get the box (without the bottom) as shown. Connect the box to the bottom plate, the bottom plate should be in front, as shown. Use a small amount of silicone sealant for sealing joints. In a bar with a rough surface with section 5×10 cm(2*4”), connecting two sections, it is necessary to drill a hole with a diameter of about 2 cm (0.8”) 2.5 cm (0.9”) from the back of the box. Set the bar with a rough surface as shown in the figure, form two branches. Secure it in place using silicone sealant. One branch of about 14 cm (6”) wide should be on the left, which will serve as the lobby. Nested branch of about 20 cm (8”) wide should be on the right. On top of the bar it should be left 4 cm (1,3”) of space. The surface of the bar must be rough so bumblebees can easily climb over it. Drill a hole (lobby entrance) in the front panel to secure the piece of pipe. This pipe has to be from the front bar to the hole in the bar. Before installing paint the tube interior with black (non-toxic) paint. In the spring queens (female-founders) are looking for mouse holes, so you need to reduce the influx light using the inlet tube. The tube should be tightly installed in the hole of the front bar and stuck to the bottom of the box. Put a cut to size piece of unnecessary corrugated cardboard (from any package) on the floor in both locations – it will make it easy to clean those rooms. Put a lump of viscose wool in nesting compartment. Attach the plexiglass over nest compartment with self-tapping screws. Use (sticky) tape as a rotating hinge for a piece of plexiglass above the lobby. This will give access to the lobby (for cleaning), without disturbing the breeding department. Transparent panel can be omitted if you are not going to observe the life of bumble bee family. Certain species of bumblebees are known to not allow such observations. Most other types range from “a few more generous” to “quite meek”. Install the top cover. 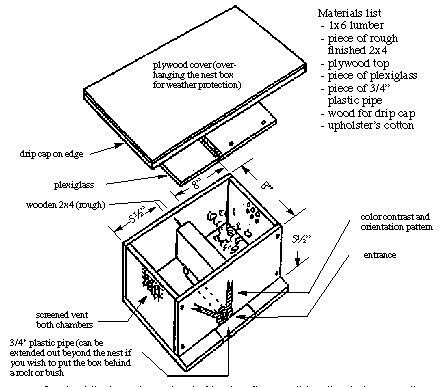 The top cover must have excess edges, so that rain water does not flow inside the box. To do this, on the edges of the cover you can attach beadings with section from 6×6 (0.2*0.2”) to 12×12 mm (0.4*0.4”). Outer part of the box should be sealed and painted, because you can not know in advance how long each box-house will wait before the queen creates a family. They need to be placed in full or partial shade. Intake port – entrance – must be from 10 to 25 cm (5-10”) above the ground, where there is no threat of flooding. Nest can be mounted on the bricks, stones, pieces of wood to seal against moisture. Put 5-6 bricks on top – so wind or animals could not move the cover. We would advise to select a region of about 3 m (10′) around the hive, where you do not mow the grass. If you want, you can cover the newly installed hive with wood chips or other mulch, providing open vents. This will help bumblebees to adjust the temperature in the nest. The next condition – patience. If the house is not inhabited until the end of July – store it in a shed for storage until next season. Hive for bumble bees should be kept in the garden from April to the end of July each year until bumble bee family appears. 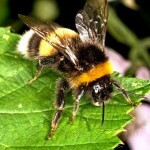 Bumblebees, which appear in early spring after hibernation – are fertilized females-founder (queens). They can search all day for two weeks, until they find the “ideal” place for the nest. 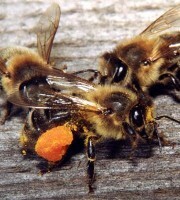 Do not open hives for bumble bees during their search. If you disturb the queen before it finally moves in, it is likely to leave the house. If you have one of three inhabited houses for bumble bees – it’s really a great success. Take up the garden houses for bumble bees each year, and hope for the best. Constantly add new nectariferous to your plants. Your garden should have flowering plants when the queen wakes up after hibernation. Construction. Hive is made of planks of 3-5 cm (1-2”) and the internal dimensions 30x20x20 cm (8*8*12”) with a possible deviation of + – 5 cm (2”). The entrance diameter is 2 cm (0.8”) with the hallway from a flexible plastic tube, bent and laid on the inner perimeter of the hive. Corridor serves for a season, and then is changed, and the hive is cleaned of parasites by heat treatment. Ready hives are painted in colors of high visibility by bumblebees – blue, purple, yellow, white and different shades. 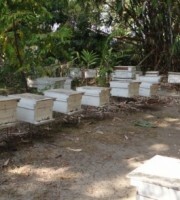 Each hive is filled to 2/3 with sterile uprooting cellulose wadding. 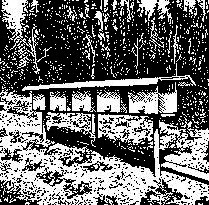 Place inside the feeder with 30% – aqueous solution of honey.Stocked hive is placed at a height of 50 cm (20”) above the ground on a table with legs smeared with glue against ants. Notch is oriented in the south-east. Placing. Hive is placed in the shade whenever possible, because the female does not like the heat in the nest. Before notch they need some space to facilitate the their search. Food abundance is very important for overwintered female . 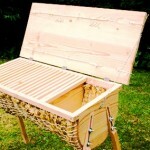 So the front is equipped with a mini-hive aviary 20x20x10 cm (8*8*4”), equipped with a feeder and closed with a mesh. The most promising species of bumblebees for practical bumble bee keeping are, in our opinion, B.hortorum L. (garden), B.ruderatus F. and B.agrorum F. (field). These types easy make nests and are excellent pollinators of red clover. Attracting of overwintered females to the hive. – return of the female to the place of its last year’s nest. Technology of catching the females: Use a piece of glass 20×20 cm (8*8”) and shuttlecock of badminton. Sitting on a flower female does not notice the glass and sit down so it can be covered with shuttlecock. If a female has leg-covering, it should be released, as it already has a nest, and bumblebee can not found the nest twice. Shuttlecock with the queen you bring to the notch, the glass is removed, and the queen a little later creeps into the hive, entrance is then closed, and a female meets the contents of the hive. Entrance is open in the morning and a mini-aviary is installed on it. After a while the queen is fully mastered, and in early morning the cage is opened. If the female has decided to live here, it turns its head to the tap hole, makes a tentative circles around the hive, increasing the loop, and then comes back in an hour. If the next day it starts to bring the pollen, it can be said that the nest is based. 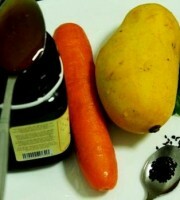 Now you should regularly in a few days change the honey in a manger. Before the release of larvae from eggs the entrance is closed in order to reduce the probability of death of females during spans. As soon as the young workers appear, you put on the entrance a plate with a hole diameter of 6 mm (0.2”), so the other queen or cuckoo bumblebee Psithyrus will not penetrate the nest. Work of bumble bee keeper during the season. First priority – feeding with a solution of honey, sometimes with fresh pollen ( bumble bees do not take artificial pollen), which is enclosed in the empty cocoons in cell. A few days later, when the brood appears, queen is caught and placed in a glass cup. Here you drive away the mites from it. You should left the crack under the glass for fresh air. In bad weather, they require intensive feeding. After the release of the workers you must increase the feeder: it helps to maintain the optimum moisture content in a bumblebees nest. Regularly put the adhesive against the ants on the legs of tables. During the appearance of young females you make sure that the nest is not penetrated by bumble bee moth caterpillar. If it is not removed, the nest will die within a week. 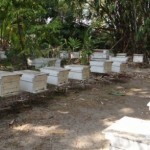 By late summer, usually around August 20, hives are attached to an aviaries, which are boxes with moist sterile peat. 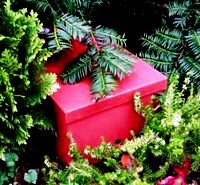 Boxes are set slightly obliquely and partially covered with moss and leaves to simulate natural conditions. When queens bury in the peat, the boxes are carefully transferred to a cold cellar. In the spring females wake during the slow rise of temperature. Period of awakening – the middle of April. Overwintered queen is used for founding of new nests, as well as for entering in a nest of the same species, where the female-founder died. Nearby nesting of bees it should be enough of spring nectariferous: heather, daffodils, primroses, crocus. Great importance for the bumblebees has goat willow – the main source of pollen in the spring. In addition to the hives for bees and bumble bees, you can plant on the sunny lawn garden wildflowers, many of them are good nectariferous. Something for the bees can be planted in the garden. Best plants for wild bees and bumblebees are white and pink clover, oregano, St. John’s wort, yarrow, sow thistle, caraway, Phacelia, white and red clover (for bees), buckwheat, sunflower, fennel, onions, borage, seed carrots , parsley, celery – and many other umbrella and Compositae plants, “weeds” – these plants are loved by bees and many other beneficial insects.